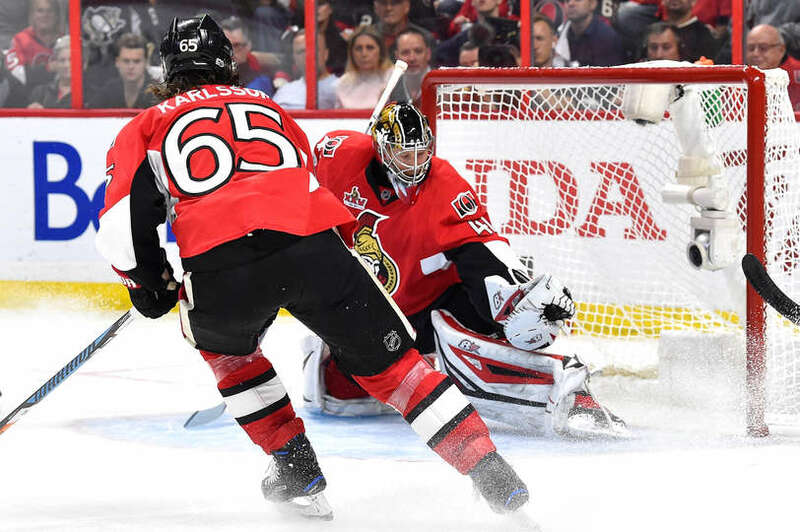 OTTAWA — The Ottawa Senators scored four first-period goals in a 5-1 win against the Pittsburgh Penguins in Game 3 of the Eastern Conference Final at Canadian Tire Centre on Wednesday. The Senators lead the best-of-7 series 2-1 with Game 4 here Friday. Mike Hoffman, Marc Methot, Derick Brassard and Zack Smith scored in the first, and Kyle Turris also had a goal for Ottawa. Craig Anderson made 25 saves. Sidney Crosby scored for Pittsburgh. Marc-Andre Fleury allowed four goals on nine shots and was replaced by Matt Murray, who made 19 saves in his 2017 Stanley Cup Playoff debut. Hoffman gave the Senators a 1-0 lead 48 seconds into the game. Methot scored at 10:34, Brassard scored at 12:28 and Smith scored at 12:52 to make it 4-0. The three goals came in a 2:18 span, the fastest the Senators have scored three in the playoffs in their history. Ottawa’s previous record was 4:00 in a 5-0 win against the Toronto Maple Leafs in Game 1 of the 2002 conference semifinals. Turris scored at 18:18 of the second period to make it 5-0. Crosby scored on the power play at 6:07 of the third to make it 5-1. “You can’t expect to win games getting a start like that, especially in the playoffs,” Crosby said. It was Crosby’s first point of the series and his first goal in eight games. “I just think we’ve got to be more ready to play from the drop of the puck,” Penguins coach Mike Sullivan said. “I think, when you give up a goal that early in the game against a team that’s playing at home, it gives their team a lot of energy. So I think we’ve got to be ready right from the drop of the puck, and we simply have to be better. We’ve got to be playing on our toes. Murray, who helped the Penguins win the Stanley Cup last season, played for the first time since April 6. He was injured during warmups prior to Game 1 of the first round against the Columbus Blue Jackets on April 12. Hoffman gave the Senators the start they wanted when he banked a shot from along the goal line off the bottom of Fleury’s pad. “I got one early on and then the crowd got into it and it seemed like we got rolling and they couldn’t play with it or stop it,” Hoffman said. With the Senators on the power play at 7:29 of the second period, Penguins forwards Matt Cullen and Carter Rowney broke out on a 2-on-1. Cullen passed to Rowney and Anderson made a sharp glove save. Smith shot the puck off the boards and gathered the rebound. He skated around the net and scored on a wraparound with Fleury out of position. Smith led Ottawa forwards in ice time with 18:44, and had four shots, five hits and one blocked shot. He also played 2:27 shorthanded. Hoffman’s goal was the third fastest in Senators playoff history. Brassard was 14-for-16 (88 percent) on faceoffs; Ottawa was 37-for-57 (65 percent) in the game. Senators forward Alexandre Burrows left the game in the second period after sustaining a lower-body injury when he was tangled up with Penguins defenseman Ian Cole in front of the Penguins net. Boucher said he was hopeful Burrows would be available for Game 4. … Sullivan dressed seven defensemen with Trevor Daley and Mark Streit returning to the lineup. … The team that wins Game 3 to take a 2-1 lead in a best-of-7 series is 205-99, including 3-2 this postseason.